We understand the 20th c in terms of atoms, molecules and gases that move. Our world is now a world of numbers and changing data and information. This art installation manipulates these numbers and the data from the living real world; all of this affects the installation i.e. the artwork in the gallery space and all the changes occur in real time. The real world is made virtual and the virtual is made real again and exposed in the process. This whole piece is a living and breathing artwork. The project focuses on the micro-incidents of change, the vibrations and sounds of the environment using wireless sensor based technologies. The gallery space becomes a live emergent sculpture to wander through. The changing life in the real time city creates all the changes one experiences in the gallery space. The leads, the wires, and cables are incorporated into the artwork to look like a city map. The installation looks “designed” like a piece of urban design, a city surveyed and controlled. The whole gallery space becomes one large artwork made from real time city information and data. The moving objects, fans, changing lights, motors, noises, that you encounter in the gallery are all responding to changes in temperature, light, pressure, noise, and the sound of the city outside. The aesthetic and feel of the space looks like an electronic city. The city is made of units, grids, repetition, building blocks. The artist’s own sensors network is laid out across the city to collect and monitor the data i.e. temperature, light, pressure, noise, and the sound of the city. The artwork is a responsive installation with embedded interactive elements. It is responsive to the live environment via sensors and interactive with its embedded CCTV systems. The artwork gathers data from the city (environment) via a custom made wireless sensor network. This is then represented virtually and then this virtual city is represented as this artwork installation. The work becomes a manipulation of data that ‘powers’ all the ‘events’ ‘actions’ and ‘processes’ in the installation. Stanza has been commissioned to develop Synchronicity, an app to be launched the same time when the exhibition at Watermans opens. The app will be available to access after the exhibition closes. Stanza is an internationally recognised artist, who has been exhibiting worldwide since 1984. His artworks have won prestigious painting prizes and twenty international prize and art awards including: Vidalife 6.0 First Prize. SeNef Grand Prix. Videobrasil First Prize. Stanza’s art has also been rewarded with a prestigious Nesta Dreamtime Award, an Arts Humanities Creative Fellowship and a Clarks bursary award. His artworks have been exhibited globally with over fifty exhibitions including: Venice Biennale, Victoria and Albert Museum, Tate Britain, Mundo Urbano Madrid, New Forest Pavilion Artsway, State Museum Novorsibirsk, Biennale of Sydney, Museo Tamayo Arte Contemporáneo Mexico, Plymouth Arts Centre, ICA London, Sao Paulo Biennale. Stanza is an expert in arts technology, CCTV, online networks, touch screens, environmental sensors, and interactive artworks. Recurring themes throughout his career include the urban landscape, surveillance culture, privacy and alienation in the city. Stanza is interested in the patterns we leave behind as well real time networked events that can be re-imagined and sourced for information. His mediums include generative artworks, paintings, installations and public artworks. 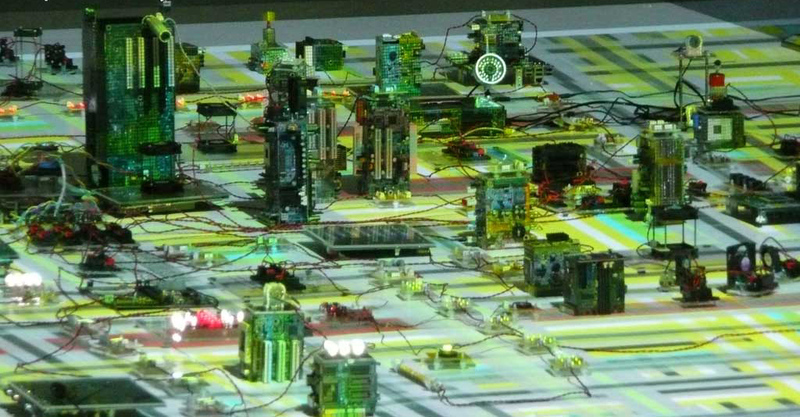 Stanza’s work crosses borders between artistic, technological and scientific sectors. He creates participatory digital artworks that invite viewers to guide data flows or to simply observe self-generating compositions. His digital paintings shift through abstract and iconic patterns, which people can explore akin to virtual environments. Interactive and visually appealing, his style also maintains the substantive power through multi-facetted content.